ABC7 in New York is reporting on the story of a Long Island mother who lost custody of her 13 year old son when she disagreed with doctors over his treatment. Kristin Thorne reports: "A mother on Long Island is fighting to have her son removed from chemotherapy treatment after he was given a clean bill of health by doctors. 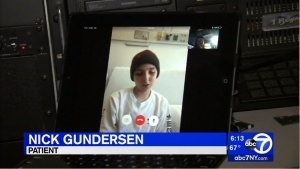 Candace Gundersen's son, Nick Gundersen, 13, is receiving court-ordered chemotherapy at NYU Winthrop Hospital in Mineola. He's now in the custody of Suffolk County Child Protective Services." Kristin Thorne also spoke with Nick from his hospital bed: "They basically took me away from my parents and that's unnecessary because they're trying to help me and they're not trying to kill me. I think that they should focus on other families that actually need help and whose children lives are actually in danger," he said.